As stir-fries go, this is a hearty one, with plenty of textures but less chopping and slicing than usual. Salting eggplant or soaking it in salted water is often done to get rid of bitterness. Here, the latter method keeps the eggplant rounds from absorbing oil. Serve with rice, or atop sweet potato noodles. Trim off and discard the eggplant stems, and then cut the eggplant crosswise into 1/2-inch rounds. Dissolve the salt in a large bowl of water, then add the eggplant rounds. Weight them down with another bowl so they stay submerged. Soak for 18 minutes, then rinse, drain and pat dry. Meanwhile, cut the onion into thin half-moons. Trim off and discard all visible fat from the chicken, then cut the chicken into 3/4-inch chunks. Peel the garlic and ginger root; mince both and place in a liquid measuring cup, along with the broth, half the toasted sesame oil, the Sriracha, fish sauce, soy sauce and cornstarch, whisking to form a slurry. Heat 1 teaspoon of the toasted sesame oil in a wok or nonstick saute pan over medium-high heat. Swirl to coat; once the oil shimmers, add the eggplant. Stir-fry for about 5 minutes, until browned on both sides, then transfer to a plate. Add the remaining 1/2 teaspoon of toasted sesame oil to the pan; swirl to coat, then add the chicken. 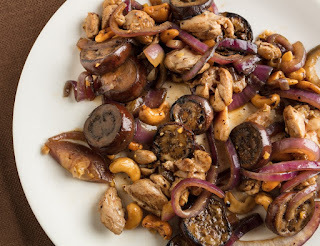 Stir-fry for 2 minutes, then add the onion and cashews; stir-fry for about 2 minutes or until the chicken is cooked through. Stir in the slurry and return the eggplant to the pan; stir-fry for a minute or two, just until warmed through and evenly coated. Divide among individual plates. Serve right away.